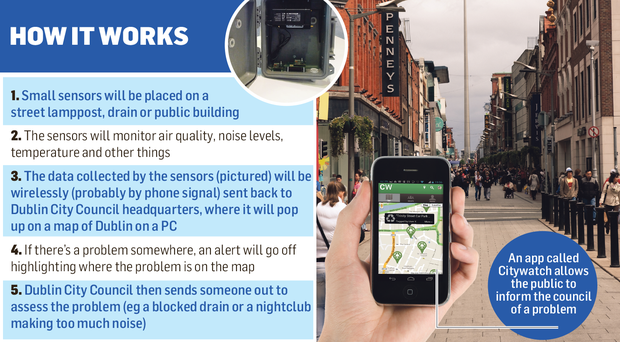 HUNDREDS of new sensors on Dublin's streets will alert local authorities to breaches in noise levels, pollution, flood alerts and other environmental measurements. Up to 1,200 hi-tech sensors from Intel are being placed on lamp-posts, drains, public buildings and other facilities in the capital to start zeroing in on "quality of life" issues for Dubliners. This next step in environmental control will see up to six sensors per kilometre on Dublin's streets, supplied by Intel and run by Dublin City Council. "We could get early warning signs if there is a threat of flooding," said Peter Finnegan, economic director of Dublin City Council. "For example, we could attach the sensors to drains to get an idea of how the system is coping. This is going to help us improve how we respond to crises in the city." Under the scheme, 200 'sensor gateways', each holding up to six separate sensors, will be spaced along streets and areas like Drumcondra, Donnybrook, Cabra and Ringsend. The sensors will host new technology in the form of Irish-designed Intel 'Quark' chips, which will record sensitive environmental information and feed it back to computers, tablets and smartphones operated by Dublin City Council. Mr Finnegan said that the information would help shape new local laws on noise and environmental issues. "We can also use them to measure noise pollution and sort out which bits we need to tackle and which are inoffensive natural noise, such as coastal noise," he said. At present, Dublin has 13 air-monitoring stations. The new city sensor network is due to go live in early June. The initial cost of rolling the city network out is being paid for by Intel, which hopes to use Dublin as a test-bed for other cities around the world. "Air pollution and noise monitoring are becoming big problems in cities around the world," said Martin Curley, vice-president of Intel Labs. "Lots of cities have problems with noise levels, such as outside nightclubs. In Dublin, what we currently do is deploy mobile crews that take measurements with decibel levels. But this rollout might be able to give much more widespread, consistent measurements." Mr Curley also said that the system would allow citizens to submit reports of possible environmental issues. "There's an application called Citywatch which overlays the sensors," he said. "So if a citizen sees something on, say, Dame Street, he or she can upload a picture through this app. "We've been trialling this with 100 users to date and we hope it will become widespread." Mr Curley said that other environmental levels to be measured could include wind speeds and temperatures. "This kind of data would be of significant interest to a lot of different types of organisations," he said. "For example, we could detect whether there are effective micro-climates in some parts of the city or whether there are other issues of concern." He said the sensors could be deployed on many different types of public utilities. "We could put them on fire stations, lamp-posts, schools and other public facilities," he said. Last week, Intel revealed that it had invested €3.6bn into its Leixlip manufacturing facility in the last three years, the largest private investment in the history of the State.